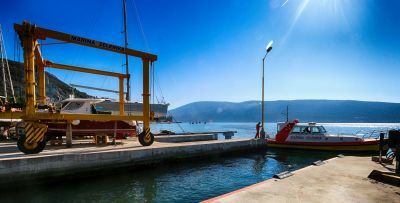 Marina Zelenika is located at the entrance of the Bay of Kotor (Zelenika Port, Herceg Novi). Majority of international boats has to register at Zelenika Port, prior to entrance Bay of Kotor, Montenegro. Marina Zelenika is Authorized Service Provider for boat engines Volvo and Mercruiser. Marina Zelenika is Authorized Dealer for boat engines parts Volvo and Mercruiser. Marinas Boatyard has capacity for 100 boats places on the land + 20 berths in the Marina. Marina Zelenika has dedicated forklift, with load capacity of 12 tons. Marina travelifts, with capacity of 135 tons, as well as, 40 tons. Crane with load capacity up to 25 tons is available for rent. We have Tow Boat available, if You need help at the sea. With more than 20 years of experience in this field, our Company "Marina Zelenika" has become recognized through best quality service, along the Adriatic Sea. Marina Zelenika is one of the major hubs for Montenegrin Nautical Tourism.